Four fine stars for this fine title, which released on OCTOBER 9 2015! It’s even available in paperback too! The Redwood Rebel is classic fantasy, and (to use the books are food analogy I love too much) it’s an excellent example of how a talented chef can breathe beautiful new life into simple, time-honored recipes. 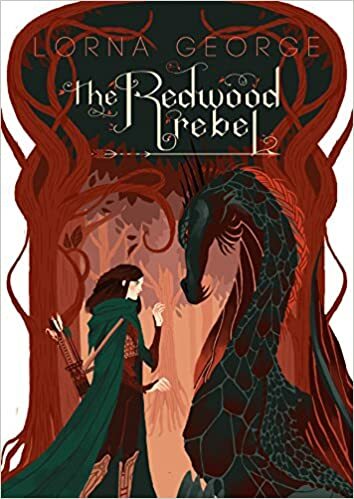 Redwood Rebel uses only the finest ingredients–an imprisoned princess, warring kingdoms, scheming relatives and courtiers, and heroic adventures–and they’re blended with great skill and an all-important savory touch of originality. I consider it a really, phenomenal grilled cheese lunch plate. That’s high praise. No, really, it is. Stick with me here. First it’s important to understand the joy of comfort foods. They are the humble meals made without pretension or wild ambitions. They are reliable, they’re familiar, and they don’t demand much from your palate or your pocketbook. Even a grilled cheese sandwich made with bland “cheese food” or gooey, tasteless bread will fill that particular hole in my life that craves fatty, salty, crunchy, melty goodness. When comfort foods transcend their humble origins and low expectations, it’s an occasion worth celebrating. Get out the party hats and noisemakers, folks. Lorna George shakes up all the classic tropes (this princess prefers to rescue herself, thank you very much!) and keeps the plotting lively with a light hand on the action and a great ear for dialogue. Redwood Rebel is a great twist on the standard take-back-the-kingdom adventure tale. The main characters have to navigate their way through a forest full of dangers natural and unnatural, all the while dealing with awkward forced alliances, major cultural differences, and personality clashes. This was truly a satisfying read for me: a filling, tasty treat I finished much faster than I intended. I want another one, right now, but I can be patient. The book wraps up with the clear expectation of sequels. ← Win a copy of Flight Plan! Lovely and delicious review of “The Redwood Rebel” from the ever-awesome KM Herks!